"This is an easy to prepare beet salad that goes great with any barbeque or summer picnic." Drain beets, reserving 1/4 cup liquid, and slice into 1/4 to 1/2 inch slivers. Add onions and toss. In a saucepan over medium heat, cook the sugar, mustard and reserved 1/4 cup liquid until dissolved. Add vinegar and bring to boil; remove from heat and allow to cool. 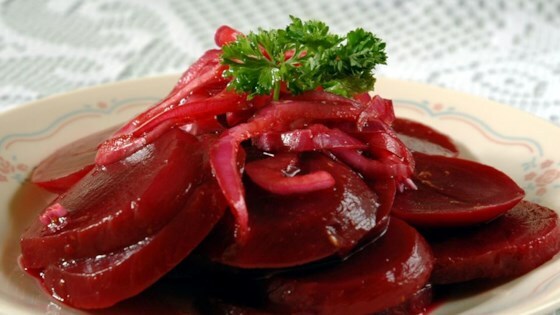 Pour over the beet slices and onions, toss and refrigerate for 4 to 6 hours. Remove from refrigerator and serve at room temperature. Nice and refreshing. I put the mustard, sugar, and vinegar w/out boiling it (i forgot to do that part) & it still came out very nice. Very refreshing but not out of this world. Thank you for this fantastic recipe. Made it for a family gathering and it's already been requested for the next. As easy as it gets (just have to remember to factor in the 4-6 hours of marinating time) and tastes fantastic. This was just the "pickled" beet recipe I was looking for. So easy and so good. Only change was to substitute Splenda for sugar. Excellent! liked it a lot. I halved the sugar. delicious with red onion. Easy, great reviews and pretty too. Easy enough for a family dinner and special enough for company. It's a keeper. Sliced canned beets were all I had on hand & worked well chopped. Delicious!! . I used lemon flavored redwine vinegar in place of the white wine vinegar though :).